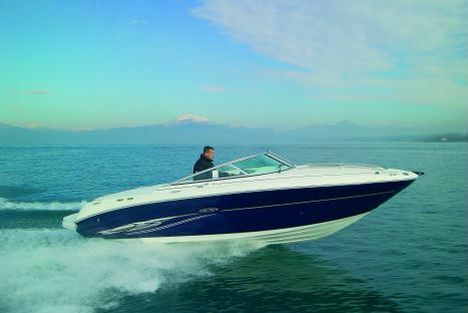 Fast, easily maneuverable and with workmanlike finish: here is how the Sea Ray 220 Sun Sport can be best described. The boat's cockpit includes adjustable pilot and co-pilot seats, 5 pockets, companionway - molded in the sliding hatchboard - supporting the practical central opening of the windshield for access on deck. In case of need, the table may be folded and stored in the lower section of the engine room hatch. The Sea Ray 220 Sun Sport offers good habitability and a comfortable layout belowdecks for short cruises: the large double V berth may be converted into a dinette during the day, under the central part of the berth there is a chemical toilet. Above, to port there is a practical and elegant pocket, near the hi-fi system. The latter includes two waterproof loudspeakers in the cockpit. Her most attractive features are stability, maneuverability and excellent performance in consideration of the moderate engine power. 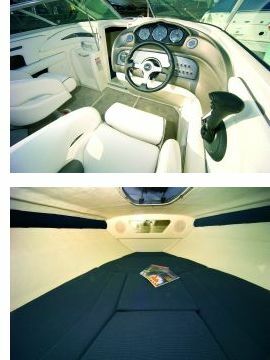 The 220 Sun Sport was designed and built for boaters wishing an inexpensive motorboat offering safety and good maneuverability and, last but not least, an interesting quality/price ratio. Road transportation: with boat trailer - Price: Euro 41,500.00 + VAT. Maximum speed at 4,600 rpm's: 38.8 knots. Standard fittings: engine room fan, cockpit cover with bag, cockpit table, AM/FM stereo with CD player and 2 waterproof loudspeakers.